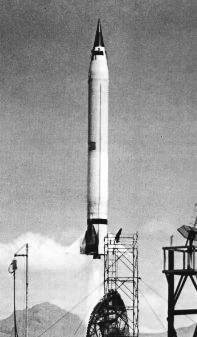 In 1946, the Naval Research Laboratory (NRL) made plans to develop a new large high-altitude research rocket, to replace the captured German V-2 and to supplement the RTV-N-8 Aerobee then in development (which had a much lower performance than the V-2). The new rocket was initially called Neptune, but this was soon changed by the Navy to Viking to avoid confusion with the Lockheed P2V Neptune aircraft. The prime contract for design and development of the RTV-N-12 Viking was awarded to Martin, while the rocket engine would be built by Reaction Motors. Numerous problems during the development of airframe and engine delayed the first free flight of Viking #1 until May 1949. The RTV-N-12 was a single-stage vehicle, powered by a Reaction Motors XLR10 liquid-fueled rocket engine. Unlike the V-2 with its external shell, the Viking's fuel tanks were integral with the rocket's fuselage, saving a significant amount of weight. 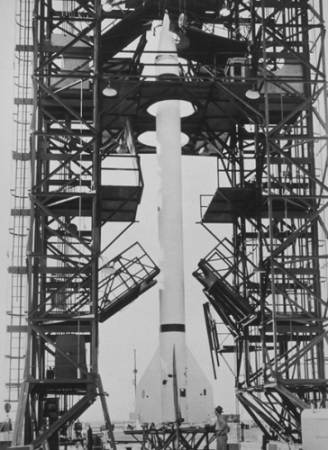 The rocket used four tailfins for stabilization and had a gimballed nozzle for active pitch/yaw control by the autopilot system. No two Vikings were exactly identical because the results of each firing would be used to implement improvements in the next vehicle. A total of seven Vikings of the original basic RTV-N-12 design were built and launched, and all flights were at least partially successful. 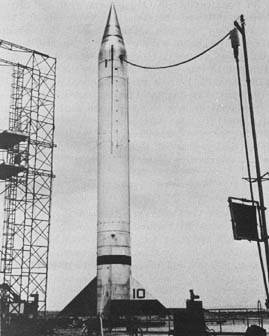 The highest altitude was reached by Viking #7 on 7 August 1951, which flew to 219 km (136 miles), breaking the V-2's single-stage altitude record. The scientific payloads carried by the RTV-N-12 included temperature, density and composition measurements in the upper atmosphere, measurements of solar and cosmic radiation, and ionospheric experiments. Viking rockets #8 and later were of a significantly revised design, and were formally designated RTV-N-12a. Externally, the RTV-N-12a was slightly shorter than the RTV-N-12, had a much larger diameter, and used triangular fins. The new external shape allowed the carriage of more fuel without a penalty in empty weight. Another new feature were small jets to control the missile's attitude outside the atmosphere after main engine shutdown. The first RTV-N-12a, Viking #8, was destroyed during a static engine test in June 1952, but Viking #9 flew successfully in December that year. The highest altitude of any Viking was reached by #11 on 24 May 1954 with 254 km (158 miles). On the latter flight, the rocket was turned by 180° at apogee and the nose cone separated, to get data on the atmospheric reentry of missile nose cones. The RTV-N-12a program was terminated after the flight of Viking #12 in February 1955. The well-tested RTV-N-10/RV-N-13 Aerobee and the various cheap solid-fueled sounding rockets had made the Viking too expensive for use as a general high-altitude research tool. However, the remaining two Vikings (#13/14) were used as test vehicles in the Vanguard satellite launch vehicle program.